Description: NO MAGAZINE SALES into NEW YORK CITY. Connecticut buyers must furnish FFL or State Permit copy. This listing is for ONE magazine. 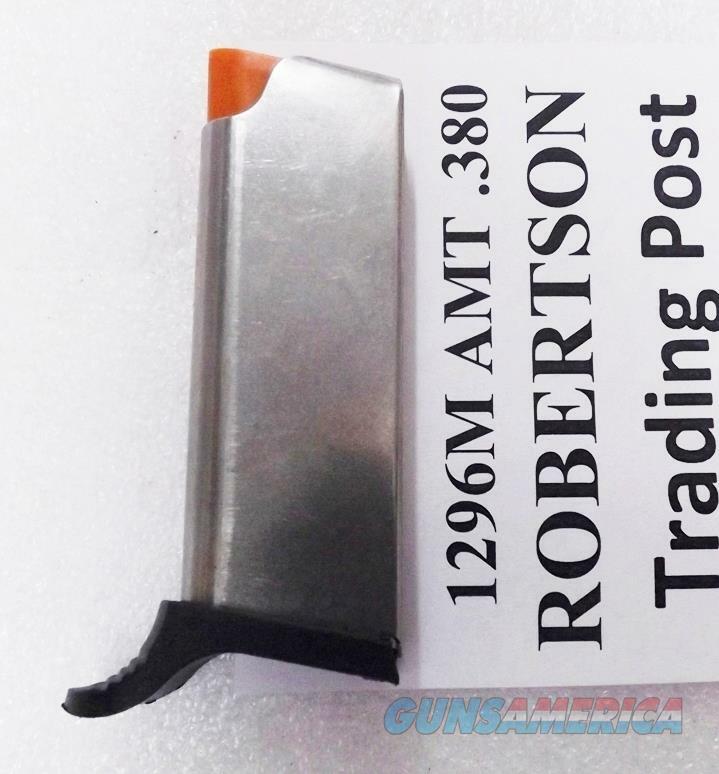 Here are US made steel replacement magazines for AMT or OMC Pistols chambered in .380 ACP caliber, and manufactured in California and then in Texas from 1978 to the present. Magazine manufacturer and warrantor is Triple K Manufacturing of San Diego. These are Not, then, AMT factory magazines. Construction is one piece folded steel body, with round count diamond perforated laterals, with full length tig welded back, steel inner plate, bench tested steel spring, and polymer finger rest floorplate and cartridge follower. Finish is buffed surface stainless steel, with smooth milled back seam. Each magazine holds 5 rounds of .380 ACP caliber ammunition. These magazines will only fit an AMT or OMC pistol chambered in .380 ACP caliber. It does Not matter if the pistol is single action or double action, because the magazine wells are the same. Each magazine comes in its factory package with statement of warranty. Shoppers who want the outer packaging should select Priority Mail shipping. Replacement pricing on original AMT Magazines will approach $50 apiece. We're offering the Triple K number 1296M, however, each	for only	$ 29.00. Not for sale to residents of New York City. Connecticut buyers must furnish FFL or State Permit copy.